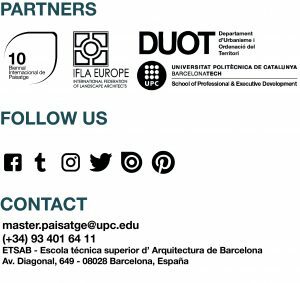 THEORETICAL COURSES – Master in Landscape Architecture Barcelona – Universitat Politècnica de Catalunya – 35ª EDITION. The Master in Architecture Landscape approached from 8 different and complementary perspectives. Each of them addresses a specific problem, for which students design different experimental solutions. The sum of these different focuses builds, at the end, an unique frame through which the student will exercise the profession.